There is nothing more exciting than transforming a space in your home from plain old ordinary to something beautiful, unique and extraordinary. If your walls could tell a story what would that story be? Below is a recent project Don of all Trades Professional Home Maintenance Services completed from start to finish. We have to say that our team but most importantly our client, loved the results! 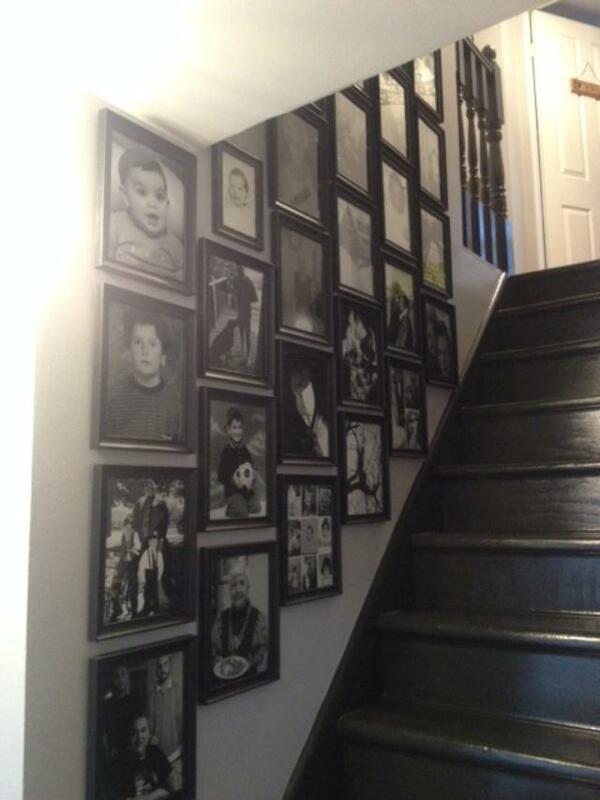 We took this small plain hallway, landing and staircase to the next level by adding special personal touches and turned it into a Memory Wall that will be enjoyed for years to come. We hope this project will give you some insight and inspiration if you are considering DIY Memory Wall of your own in your home. You have to start with a perfectly smooth surface to end up with perfectly painted walls or woodwork. Remove any removable elements like railings, door handles, light fixtures, picture frames and so on. Even if your steps, railings, walls, ceilings, trim, doors and baseboards appear to be clean, it will still be covered in dirt, grime and oils from hands. So, make sure to give it a once over with some warm soapy water. we just used a mild dish-soap, followed up with a final pass of clear water, so we didn’t leave behind any soapy residue. Then, just allow ample dry time before applying your first coat of paint. Have a good look at the conditions of your walls and ceilings to find any rough patches, holes or damage that might need re patching, sanding and repair accordingly. The original railing was in need of repair. A new stair newel post, new top rail and mounting hardware was installed. Instead of replacing the stairs with new ones, broken steps were repaired, finished grade plywood was installed to eliminate creaking and to help add more strength to the steps. Are the walls in your home in need of a fresh coat but not sure what color to choose? Talk with the paint experts to find out what colors are trending in 2018. The steps were painted with 2 coats of a Charcoal Shade and finished off with 2 coats of water based varnish satin coat with #Serenity brand #Cottagepaint which was purchased at the Benjamin Moore Whitby Shores Decor Centre. Although making the decision of trying something completely different by painting these steps a dark color was a difficult one, this client was extremely pleased at how they came out. Walls were patched and sanded. Even the front hallway closest got fresh coat of paint inside and out. Walls were painted in a shade of grey, all ceilings and trim were painted in a white. Remember that stairways and halls must have good general lighting for safety. To prevent accidents, stairs should be lit from top to bottom with switches in both places. For safety in hallways, place lighting fixtures every 8 to 10 feet (2.4 to 3.0 m). Tie in the fixtures you choose by matching your foyer chandelier or pendant with close-to-ceiling fixtures for hallways and smaller chain hung fixtures for stairways. The original outdated lighting was replaced with more modern energy efficient Hampton Bay 12 inch brushed nickel led flush-mount light fixtures. These ceiling light fixtures are engineered to save you money, and they are designed to look great. This collection is a modern, elegant style featuring a brushed nickel finish and frosted glass shade that diffuses the light so that there are no shadows or dark spots. These ceiling lights are built with steel to look great and save you money for many years while blending nicely with the decor of your home. Applying a wall decal can be a quick and easy way to add a new style to any room or space. We did some research on line and found a great website that offered a huge variety of non-permanent beautiful wall lettering quotes that was delivered right to their door. Measurements were made prior to making an order to ensure it would fit the space on the wall it was going to be applied to. Our client chose the MagicWall Family Memories Wall Lettering in colour-black-48×13 inches (122 x 33 cm) size to help tell their family’s story. This beautiful wall quote was super easy to apply and was applied to the right side of the wall above the hand railing. One of the most common reasons people develop their photos in black and white today is because it lends a certain timeless quality to the images. These photos helped tell the story of what is important to our client. This special project was completed to create a space to tell a story ranging from important moments from the the past to present. Special moments of youth, dating, marriage, birthdays, holidays, friends and family members, home, pets and children growing up. A total of 40 photos were developed online through Wal-Mart Photo Centre. All photos were reprinted in 8×10 sizes (at a very reasonable price) on the wal-mart photo centre website in black in white to keep the theme the same and to give them all a timeless quality to the images. A total of 40 Nikolai 8 x 10″ Black photo frames were purchased on the Walmart.ca website (again at a very reasonable price) and were conveniently shipped to our clients door within 4 days of ordering. To help keep the damage to the walls to a minimum, Command Brand Damage-Free Picture Hanging Strips were used to hang all photos. These strips were a perfect solution to prevent filling in 40 nail holes in the walls later on in the future. Have a question about your home improvement project? We offer a wide range of home improvement services for your home including FREE ESTIMATES in Durham Region. Call 905-259-5249 or email infodonofalltrades@gmail.com. Visit our website at: http://www.donofalltrades.ca to find out more! 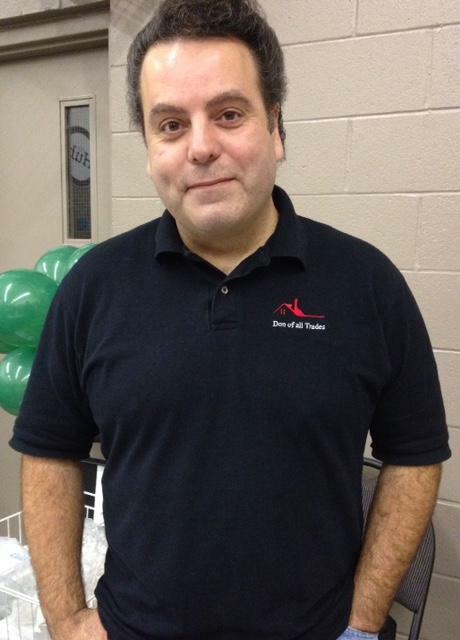 Donato has over 20 plus years of experience. His company has completed various projects for many clients. Donato’s philosophy is to always treat “YOUR HOME AS IF IT WERE HIS OWN”. His goal is to provide quality service at affordable prices without compromising the finished product.